Mejia’s first book, The Last Act of Hattie Hoffman, was a wonderful study of a small town dealing with large problems. In Leave No Trace, the trouble is much more personal. The city of Duluth is rocked when a store theft turns into something more deadly and the young man at the centre of it is the near-mythical Lucas Blackthorn: The Lost One, the boy who vanished into the Minnesota woods with his father ten years ago. With Lucas unresponsive and violent, the only person who seems able to get through to him is the punky, capable speech therapist Maya Stark. Once she establishes that Lucas is no wild boy, but a grown man perfectly capable of lucid conversation, other things become clear: Lucas is angry, scared, and he knows something about Maya that even she does not, something about her and the Boundary Waters where he was lost. As the two form a bond, the secrets that all crime fiction protagonists keep begin to surface, and Maya can only help with Lucas’s future if she is able to confront her own past. Mejia is a beautiful writer, and the Boundary Waters and Minnesota’s forests and rocks alike come alive on these pages. Maya is tough, able to fight off any of the patients in the psychiatric institution she works in, but also unable to make any real friends in a world where she has only known abandonment and pain. Even her father, who she loves, leaves too often – or not often enough – for the lakes and the shipwrecks underneath them. In the solitary and struggling Lucas, she finds something of a kindred spirit, even though he leaves a trail of violence behind him like footprints in snow. This is an icy and compelling tale of loss, death, and discovering what’s underneath the frozen surface of a human being. Twenty-four years ago, on the tenth of October, Katharina Haugen half-packed a suitcase, selected a pile of books from her shelf, took a picture out of a frame, wrote a numerical code on a notepad and then vanished. In the intervening years, Chief Inspector William Wisting has spent each ninth of October going over the case files, and the tenth of October with Katharina’s husband Martin. This year, Wisting feels like there is something in the files he’s overlooked, but then, for the first year, Martin is not there for their meeting. When a cold case investigator comes to Wisting, it’s not to reopen Katharina’s case as Wisting thought, but to look into a decades-old kidnapping – where Martin has now become a suspect. Wisting is smart and driven, while also being quite an adorable grandfatherly type, and along with a riveting pace, it’s hard not to become as emotionally invested in the case as the Chief Inspector himself. In a town in Germany’s picturesque Black Forest, a fire burns in a shed, bright as the gates of hell. The fire brigade and local volunteers are called to quench the flames, and everything is under control – just hay in there, the owner maintains – when the earth caves in and the weapons cache underneath explodes, killing a volunteer and devastating the community. To Louise Bonì, recently returned from her time trying to heal at a Buddhist monastery, and to the colleagues somewhat bemused by her, it rings with a familiar case of Yugoslavian arms dealers, unless, of course, it’s the cache of neo- Nazis. Things get less historical when someone is freshly shot, and with the Secret Service breathing down Louise’s neck, she needs to stay tough to find out what’s going on. And toughness is something Bonì has in absolute spades. Taylor is Angus’s Sunday Girl, the one who makes him happy, the one who he can introduce to his parents, the number one girl for him. Taylor is also the woman that Angus cheats on, insults, and hurts. So when Angus crosses a line that Taylor doesn’t realise she had, she chooses not to move on but instead to rain hell on his cocaine-dusted shoulders. It starts small – a little breaking-and-entering here, a little light hacking there – but soon things have spiralled out of control, and Taylor is left to pick up the pieces. Or, if she’s really honest with herself, knock more over. This is a spicy vengeful cocktail with a healthy splash of comeuppance. 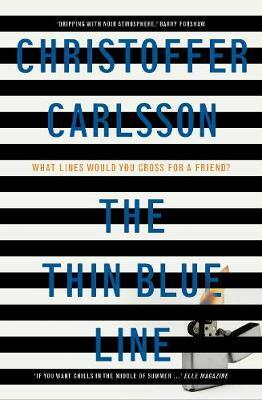 Author Christoffer Carlsson has a PhD in criminology, a floppy fringe, and a series of crime books starring Detective Leo Junker that are absolutely worth your time. Leo’s entire police department is in the middle of some reconstruction that has left everyone at a loose end and feeling frustrated. Leo is still reeling from his best friend John Grimberg’s betrayal and subsequent disappearance, the effects of his previous cases, and fighting his addictions, but these worries still don’t stop him from agreeing to meet a stranger in an unfamiliar location after an envelope is shoved through his door. To his surprise, the stranger turns out to be Grim himself, asking Leo not for forgiveness but to open up the cold case of the dead Angelica Reyes. When no one has any definite jobs, it’s an easy time to throw yourself into a cold case, so despite misgivings, Leo does – and what he uncovers will go straight to the dark heart of Sweden. Truss, known mostly for her comedy and for her book Eats, Shoots and Leaves (for which the phrase ‘bestseller’ seems like a vast understatement), enters the crime fiction world with this midcentury English farce. Brighton’s Inspector Steine is very pleased with himself after his town’s criminals all dispatched of each other in the ‘Middle Street Massacre’ of 1951, and enjoys his newly crime-free neighbourhood, even though not all his fellow officers quite agree with him. Even worse for Steine, keen new Constable Twitten arrives with enthusiasm and his name on the front cover of the book, and stumbles upon a theatre based murder almost instantly. Hilarious, ridiculous, and suitably dramatic. A book by one of the writers of The Wire, about ex-cons, hard men and reading? Tick all our boxes, George, why don’t you? Anna is a prison librarian who finds in one inmate a keen reader until the day he is no more: an error in his trial sees him suddenly set loose on the city of Washington DC without any idea how to deal with this new, changed city. Pelecanos has a knack for characters, and Michael is surrounded by them, good and bad, tempting him to revert to the life that got him thrown in the clink in the first place, or tempting him instead with what we all know to be the most important thing around: books. Thrilling, gritty, and literary. Apart from being the book that finally made me twig that all of Overington’s books have ‘One’ in the title, this media-circus tale sounds utterly compelling. Set in the tightly-run world of morning television, Emma Cardwell is the co-host of Cuppa, the rival show to Brew, and gets home one night to her husband asking her where their toddler daughter, Fox-Piper, is – but Emma could ask him the same thing. Neither picked her up from daycare, but somebody did. And there is no news like the news that a celebrity’s daughter has been kidnapped. Overington really knows her stuff, and this is both meaty and gossipy, thrilling and tense, and a behind-the-scenes look into a cut-throat world. Perenially bestselling author Lemaitre returns with an affecting thriller that plays into readers’ greatest fears – that of workplace achievement turning to failure. It’s been four years since successful HR executive Alain Delambre was made redundant, and he’s spent those four years working menial jobs for little pay, just to keep his mortgage repaid and his family happy. His one steady stream of income is put in danger after a violent reaction to his manager’s latest assault, but luckily, he’s finally been offered a chance: after interviews, a HR company wants him to come in for a final test. B.L.C. Consulting needs to separate the wheat from the chaff of its employees, and to do so, is going to stage a hostage situation in the office – and an enthusiastic Alain is going to judge them. But Alain has had enough of being the underdog in this world, and when the game becomes a bit too real, so will one man’s pent-up frustration. A delegation crosses the Congolese border from Uganda, aiming for peace talks with the notorious Joseph Kony. In the delegation, thanks to some wheedling, is Australian Tessa Lowell, who is in Africa researching child soldiers and the cost of the war on these young lives. When the talks go nowhere and Tessa’s camp is stormed, she is captured by rebels and has nowhere to go – but she does have someone to talk to: thirteen year- old child soldier Francis. Meanwhile, her stricken parents have turned to their son, Stephen, who is living in South Africa and may have a way to help her. But his ways are not scrupulous, and in a time of country-wide unrest, one family just may have its own war to contend with. In late September you’ll find Robert Galbraith’s fourth Cormoran Strike book, Lethal White which we are not allowed to read prior to release on pain of death (probably); Lynda La Plante’s Murder Mile; Sophie Hannah’s new Hercule Poirot tale, The Mystery of Three Quarters; Val McDermid’s Broken Ground; Alexander McCall Smith’s 19th (!) Number One Ladies Detective Agency book, The Colours of all the Cattle; Frederick Forsyth’s The Fox; Faye Kellerman’s Walking Shadows; Jonas Bonnier’s The Helicopter Heist; B.M. Carroll’s The Missing Pieces of Sophie McCarthy; Charlotte Duckworth’s The Rival; Jack Jordan’s Before Her Eyes; and Mary Kubica’s When the Lights Go Out … and more. Plus, for even more crime recommendations, make sure you check out the 2018 winners of the Davitt and Ned Kelly awards!